Australia has built a solid reputation for being a great place to live. Part of that reputation comes from the level of education provided by facilities throughout the country. In recent years, these qualities have attracted over 2.5 million international students to travel to Australia and take up studies in a range of different industries and disciplines. During this time, you are allowed to stay in Australia via a Student Visa. Studying in Australia can be your first step to Permanent Residency. WHAT INDUSTRIES ARE HIGHLY REGARDED? While the desired occupations change each year depending on changing requirements in Australia, there are some industries and careers that remain in high demand. You should consider how you can apply your skills to attaining qualifications in these industries to improve your chances of attaining permanent residency. ACCOUNTANCY is an excellent industry to consider as it is one of the fastest-growing in Australia. This led to the number of international students undertaking studies in accountancy to increase by 500% between 2001 and 2014. A career in Accounting can offer ongoing employment with corporations and businesses throughout Australia. You can specialize in areas such as Taxation, Finance, Compliance and Record Keeping. ENGINEERING also opens opportunities for employment. Engineers are required in multiple industry sectors in Australia. Students can steer their studies to achieve graduation in specific fields of particular interest to themselves. These include: Chemical, Civil, Structural, Mechanical and Aeronautical Engineering. Students seeking Permanent Residency might also consider a career as an Agricultural Engineer, Plant Engineer, Production Engineer and in Telecommunications. In the area of technology, there is a growing demand for Software Engineers. Students can also follow specific areas of interest such as Biomedical and Environmental Engineering. These industries provide excellent employment prospects. Careers in Engineering offers some of the highest salaries in the country. INFORMATION TECHNOLOGY is recognized as a fast-paced industry where the demand for qualified and skilled technicians continues to grow. Australia’s demand for new technology opens some of the best opportunities for those students who choose a career in IT. By referring to the Skilled Occupation List, student will recognize a number of studies offered by Australian Universities that prepare them for an extensive and interesting career in this field. Those applicants who have excelled in IT in another country can also achieve their desired residency in Australia due to this high demand. TRADE QUALIFICATIONS offer a great opportunity to international students who choose to undertake studies in specific fields. With the growth in housing and construction, Australia has a high demand for qualified electricians, plumbers, carpenters, construction workers, building workers and trade assistants. The Government of Australia is happy to facilitate the migration of qualified and experienced tradespeople who demonstrate proficiency. To ensure the quality of tradespeople in the country, authorized Trade Institutes assess the skills of individuals and offer opportunities for them to upgrade their skill levels through further education. Individuals assessed in this way may already reside in Australia, hold a Temporary Work Visa or be an off-shore applicant for a Permanent Residency Visa. EXPERTS IN IMMIGRATION FOR PERMANENT RESIDENCY. If you are looking to studying in Australia, already hold a Student Visa and you are seeking Permanent Residency in this country, you must seek the help and information of a Visa Consultant to enhance your opportunity of success. 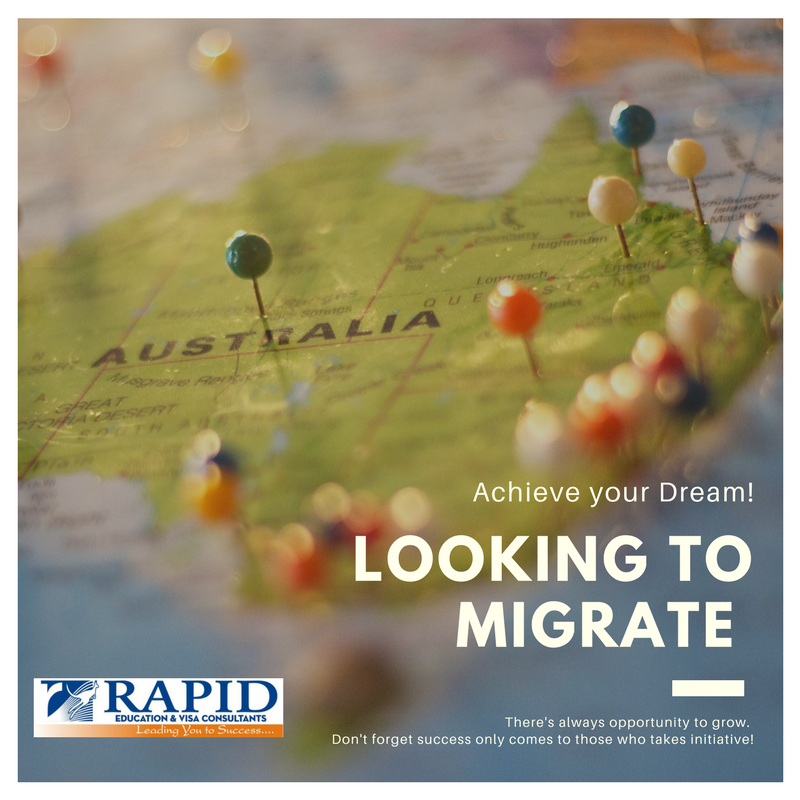 Rapid Migration is recognized as experts in assisting international students in achieving this highly desired goal.